Vafaei, V., Kheiri, H., Javidi, M. (2015). Chaotic dynamics and synchronization of fractional order PMSM ‎system. Sahand Communications in Mathematical Analysis, 02(2), 83-90. Vajiheh Vafaei; Hossein Kheiri; Mohammad Javidi. "Chaotic dynamics and synchronization of fractional order PMSM ‎system". 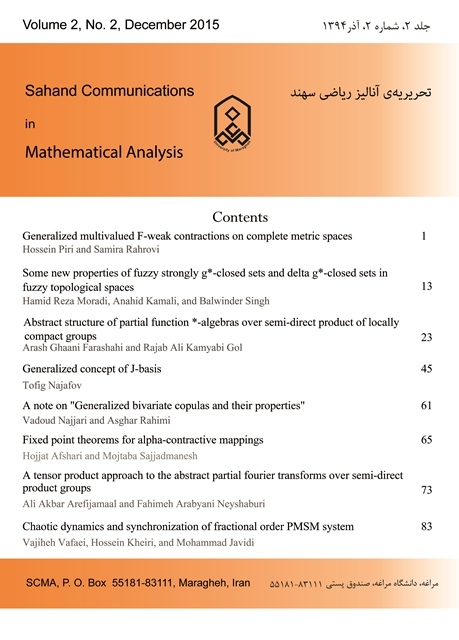 Sahand Communications in Mathematical Analysis, 02, 2, 2015, 83-90. Vafaei, V., Kheiri, H., Javidi, M. (2015). 'Chaotic dynamics and synchronization of fractional order PMSM ‎system', Sahand Communications in Mathematical Analysis, 02(2), pp. 83-90. Vafaei, V., Kheiri, H., Javidi, M. Chaotic dynamics and synchronization of fractional order PMSM ‎system. Sahand Communications in Mathematical Analysis, 2015; 02(2): 83-90. Faculty of Mathematical sciences, University of Tabriz, tabriz, Iran. ‎In this paper, we investigate the chaotic behaviors of the fractional-order permanent magnet synchronous motor (PMSM) system. The necessary condition for the existence of chaos in the fractional-order PMSM system is deduced and an active controller is developed based on the stability theory for fractional systems. The presented control scheme is simple and flexible, and it is suitable both for design and for implementation in practice. Simulation is carried out to verify that the obtained scheme is efficient and robust for controlling the fractional-order PMSM system. erential Equations, Springer-Verlag, Berlin, 2010. K. Kemih, Control of nuclear spin generator system based on passive control, Chaos Solitons Fract., 41 (2009) 1897-1901. N. Laskin, Fractional market dynamics, Physica A, 287 (2000) 482-492. doi:10.1016/S0378-4371(00)00387-3. J.G. Lu, Chaotic dynamics and synchronization of fractional-order Arneodo's systems, Chaos, Solitons and Fractals, 26 (2005) 1125-1133. L.M. Pecora and T.L. Carroll, Synchronization of chaotic systems, Phys. Rev. Lett., 64 (1990) 821-824. H. Salarieh and A. Alasty, Chaos synchronization of nonlinear gyros in presence of stochastic excitation via sliding mode control, J. Sound Vib., 313 (2008) 760-771. M.S. Tavazoei and M. Haeri, Chaotic attractors in incommensurate fractional order systems, Physica D, 237 (2008) 2628-2637. Z. Xing-hua and D. Shou-gang, Adaptive chaotic synchronization of permanent magnet synchronous motors with nonsmooth air-gap, Control Theory and Applications, 26 (6) (2009) 661-664.